I’m kind of embarrassed to admit this but recently I had this crazy Mr. Noodles craving. I was under the weather a couple of weeks ago and all I wanted was Mr. Noodles in chicken broth with extra crackers. So much, in fact, that I ran quickly to Co-op right after work and bought 4 packets of Mr. Noodles along with a huge box of saltines. My total was like $3.69. For four meals. Tell me why I spend so much on groceries each week? A fact about me: I like so many crackers in my chicken noodle soup that it isn’t really “soup” anymore, but more of a delightful, salty slop. I just love that neon yellow broth packet with ramen and it screams comfort food to me, right down to the days when I was sick as a little kid. And it works too, because after two meals of Mr. Noodles I was back in the saddle again, feeling like my old self. Anyway, I’ve noticed that ramen is getting kind of trendy again. I saw a few awesome gourmet versions of it recently (take this one, for example) around the internet and I decided to make something more upscale for a noodle soup too. Then I saw this recipe and I knew I had to recreate it. This is a perfect Summer going into Fall meal and it literally took me less than a half hour to make. 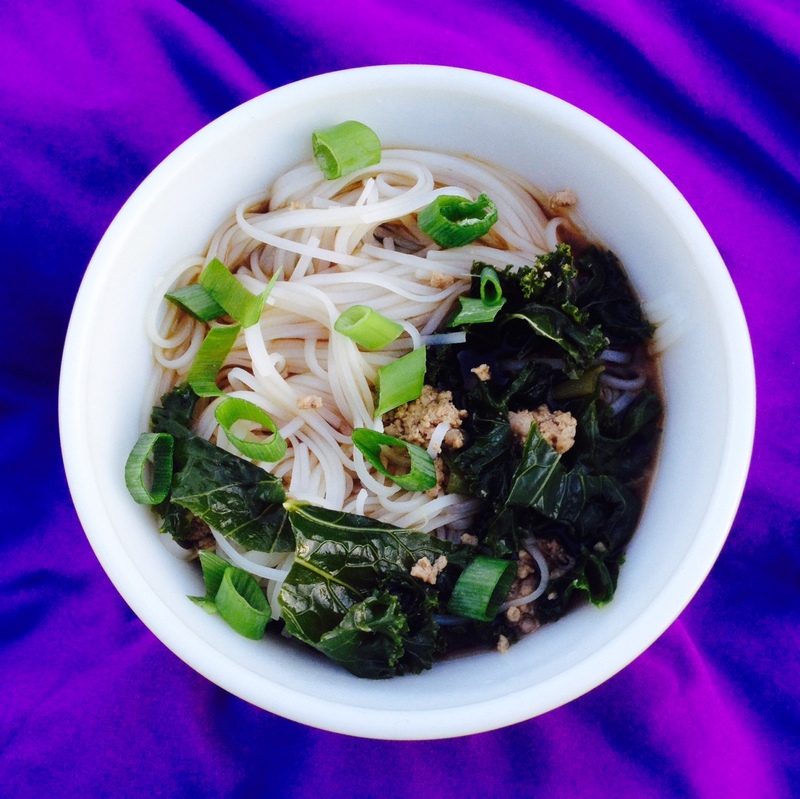 It’s got lots of hearty greens, an Asian spiced pork mixture and a salty, savory broth with lots of kick. And when I say kick, I mean it. My Main Taste Tester had the hot sauce ready to go for this one and ended up leaving it off. That should tell you how crazy flavorful this mix is. And let’s not forget about the best part; I initially made it with rice noodles but I’m totally using ramen next time. You should try it too, if you’re into that kind of thing. Heat oil in a large pot over high heat. Once hot, add the pork. Season it with the garlic, lemon juice, cumin, ginger, red pepper, black pepper and garlic salt. Break pork up with a spoon as it cooks. Cook until browned, about 7 minutes. Once pork is cooked add the stock, soy sauce, fish sauce and green onion. Bring to a boil and then turn back down on low to simmer for about ten minutes. Add the chopped kale and stir it in (it will look like a lot but it will cook down significantly). 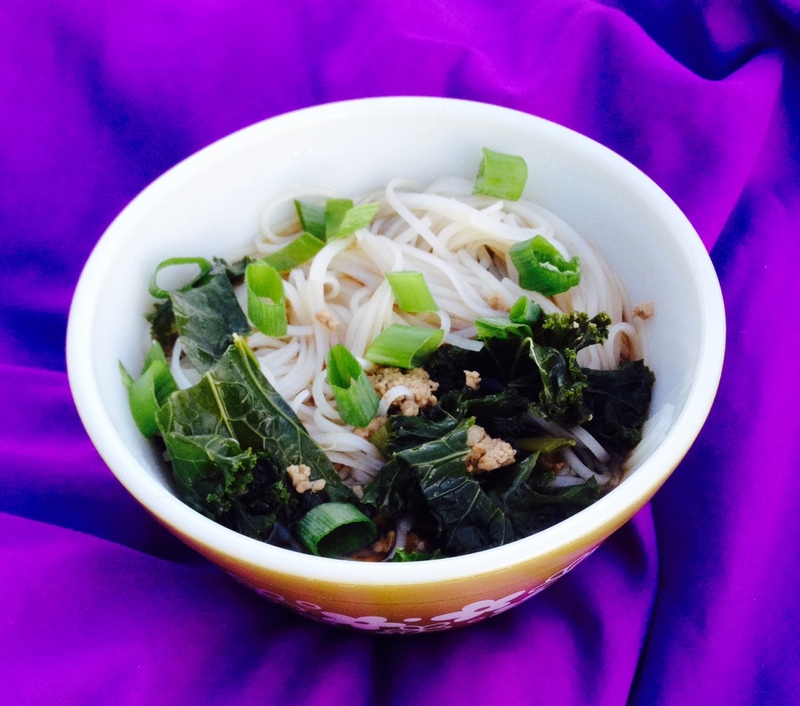 While the pork and greens mixture simmers, cook the rice noodles according to package directions in salted water. Once noodles are cooked, drain, rinse with cold water and place back in the pot they were cooked in. To serve, ladle a couple large scoops of pork and greens mixture with broth in bowls. Top each bowl with a scoop of noodles and garnish with diced raw green onion.